On August 16th and August 17th 2017, StoneSmart Solutions, LLC (StoneSmart) hosted a Blast and Ballistic Testing event for the ProtectiFlex Precast Systems. The event and testing were hosted at our Stone-OBL's Blast Testing Facility outside of Bend, Oregon. StoneSmart introduced to selected representatives from the government, private and industrial sectors our latest innovative construction material technology named ProtectiFlex that has been developed in precast form to provide an effective solution against multiple extreme loading hazards. Solid precast panel form of the ProtectiFlex composite material as an alternative to normal and high strength concrete precast form solutions against far and close-range explosion threats that have been designed, developed and tested with various thicknesses to a variety of blast and ballistic threats. Light Steel Stud wall layout constructed compositely with thin ProtectiFlex composite precast panel façade systems as an alternative to existing lighter façade construction designs utilized in the protective design community for blast mitigation. 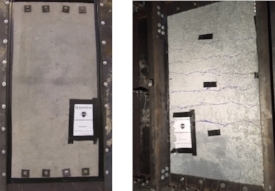 StoneSmart is excited to announce that we have successfully introduced ProtectiFlex- our latest innovative material technology -that resembles precast concrete or masonry block construction. The test samples were in various precast forms and thicknesses and have exceeded the performance of reinforced concrete and masonry solutions with their enhanced tension-to-strain material characteristics, optimized density (a reduction of at least one-third of the weight of standard concrete), enhanced damping properties and minimized fracture/spall mechanisms. This event allowed the attendees to observe and participate in blast tests, have one-on-one conversations with the StoneSmart team regarding ProtectiFlex’s product capabilities, applications and advantages over other standard and innovative mitigation materials, and address various questions and comments. 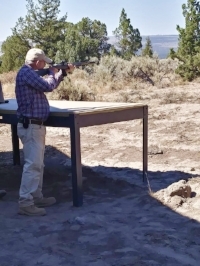 The attendees also had supervised access to fire-arms to experiment and witness themselves the performance of the ProtectiFlex material for a variety of panel thicknesses to multiple ballistic shots up to 0.50 caliber bullets. For more information on ProtectiFlex USA please visit StoneSmart Solutions.